We celebrated Mr. S's birthday this week. 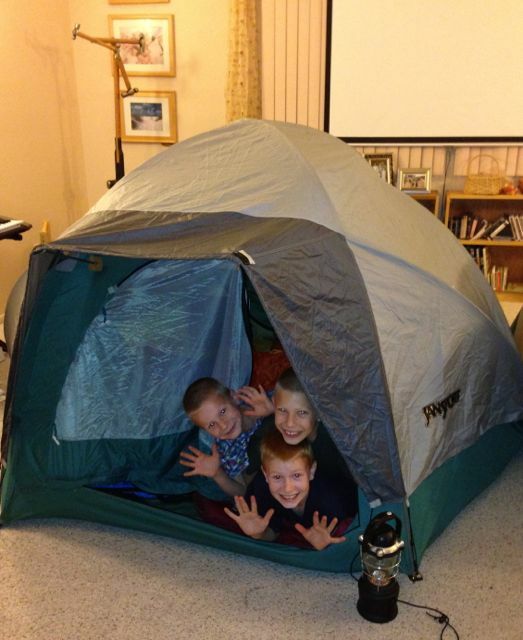 He asked Daddy to set the tent up in the living room so that the two of them could camp out. Then his brothers wanted to join him. The boys took over the tent and Daddy joined them for a while, then slept on the couch. Around midnight I heard quite the commotion in the living room. Shortly after Rob joined me in our bed. It seems the cat found a mouse in the house, near the tent. The boys were all eager to tell the story in the morning and I'm thankful for our cat! While I love doing my kid's cakes I'm finding that they are often wanting to be more hands on or even take over the job these days. Mr. S had his own ideas for his cake. Still being a bit sick with "morning" sickness I was more than happy when Mr. S wanted to take over most of the job this time. 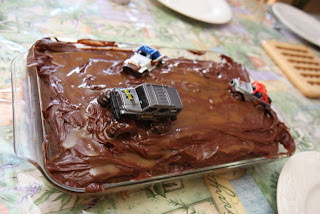 He put this Off Roading cake together on his own (he even washed the cars before putting them on the cake).